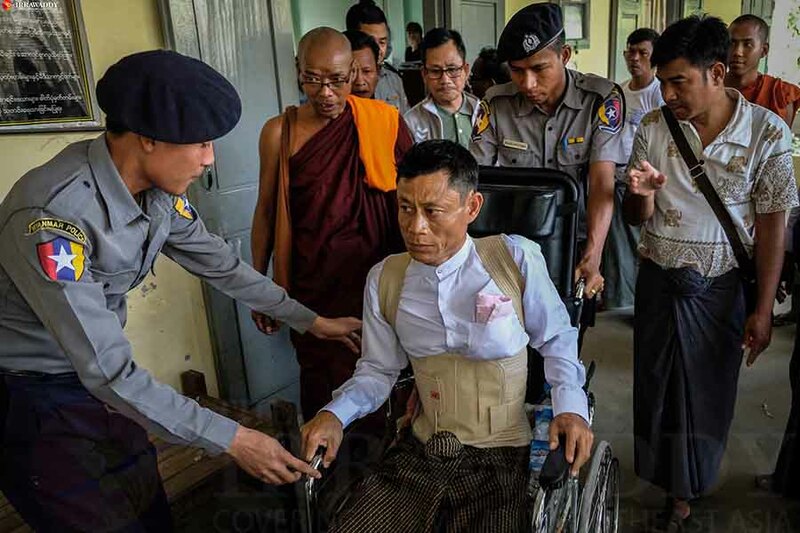 YANGON—This week, Ko Swe Win, the editor of Yangon-based news outlet Myanmar Now, made his 52nd journey to Mandalay Division’s Mahar Aung Myay Township Court, which is hearing a defamation case opened against him in March 2017 by a supporter of ultranationalist monk U Wirathu. The 780-mile round trip takes at least 16 hours, meaning Ko Swe Win has traveled more than 37,000 miles, and spent some 1,500 hours on the road, in the past year and nine months. That’s the equivalent of traveling from Yangon to San Francisco and back again—twice. Such cases are normally heard in the township in which the defendant resides. The absurdity of Ko Swe Win’s ordeal—being forced to make the trek, at least twice a month, to a courtroom hundreds of miles from his home month after month—underscores the hostility of the environment that Myanmar journalists now operate in. In the course of doing their jobs, they now face the threat of prosecution from virtually all sides, including the government, the Army, supporters of the ruling National League for Democracy (NLD) and other groups. The huge cost the defamation suit is imposing on Ko Swe Win in terms of energy, time and financial resources can only be seen as a form of punishment in itself. As the case drags on, it is taking its toll on him and his family. Considerable attention has been paid in the press to the use of Article 66(d) of the Telecommunications Law—which prescribes jail terms for those found guilty of using the media to defame someone—by lawmakers and the Army against their critics. Despite a recent reform of the law, defamation cases under the controversial legislation have actually increased under the current government. Less often talked about is the use of the law by ultranationalist monks and their supporters to silence journalists. Few cases illustrate that effort better than Ko Swe Win’s. After Muslim lawyer U Ko Ni, a legal adviser to the NLD, was gunned down in January 2017, U Wirathu publicly praised Kyi Lin, who shot U Ko Ni dead in broad daylight at Yangon International Airport, and his conspirators. 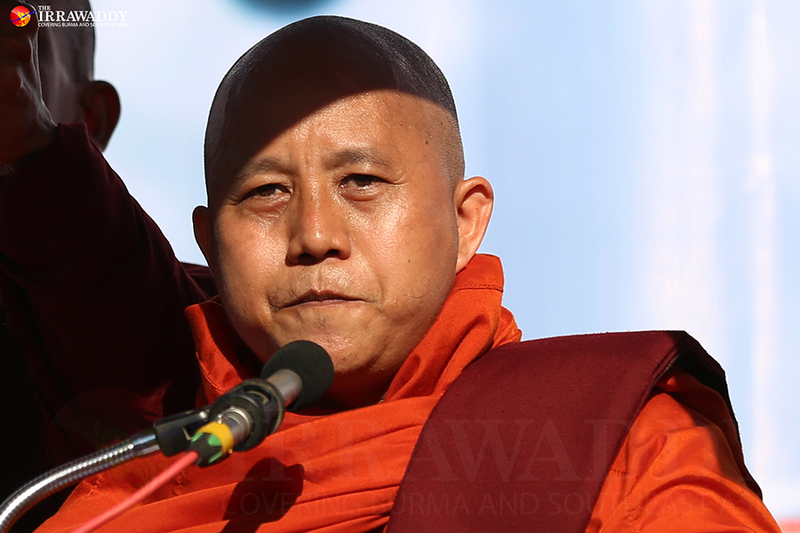 Myanmar Now published an article accusing U Wirathu of committing a grave sin by cheering on the perpetrators, saying he had essentially nullified his status as a monk. Ko Swe Win shared the article on his Facebook account. In response, a follower of U Wirathu, Mandalay-based nationalist Kyaw Myo Shwe, opened a case against Ko Swe Win under the Telecommunications Law at Mahar Aung Myay Mandalay Police Station. Four months later, on July 30, 2017, in an apparent breach of standard police procedure, Mandalay police arrested the Myanmar Now editor at Yangon airport as he was preparing to travel abroad. The following day, he was granted bail after signing a note in front of the judge promising to appear in court for every hearing in the case. Since then, Ko Swe Win has become all too familiar with the route from Yangon to Mandalay. Each round trip costs Ko Swe Win more than 500,000 kyats (about US$330). His total expenses so far including lawyers’ fees and contracts, exceed 25 million kyats (about US$16,415). He had previously hired several lawyers and legal advisers but parted ways with them as he was unsatisfied with their performance. Currently, he has contracted with lawyer U Thein Aung, who is also an Upper House lawmaker for the NLD. The lawyer’s rate was set at 6 million kyats (nearly US$4,000). Lawyer Daw Ywet Nu Aung, who is part of the same legal team, has been assigned as Ko Swe Win’s defense lawyer. The financial burden and the time involved pose a huge problem for the Myanmar Now chief editor. Each trip takes at least two days, whether or not the plaintiff appears in court. “If the hearing is set for a weekday, my work week is reduced to two or three days. I have no free time because I end up working on Saturdays and Sundays to make up for the lost time,” he said. Despite this, Ko Swe Win has not missed a single court appearance. On the other hand, the plaintiff’s witness, U Wirathu himself, is based at a monastery just a 10-minute drive from the courtroom. This didn’t prevent him from failing to show up for the 48th hearing, in December. Despite the failure of the monk to present oral testimony to the judge and submit to the defense’s cross-examination, four or five novices came to listen to the hearing, arriving in a car belonging to Ma Ba Tha, the Association for the Protection of Race and Religion. Ko Swe Win has been verbally threatened by a Ma Ba Tha follower in the courtroom, and on another occasion his then lawyer, U Myo Min Zaw, was interrupted by a group of nationalists while he attempted to question the plaintiff. The nationalists challenged the lawyer with questions like, “Aren’t you a Buddhist?” Whenever there is a hearing in Ko Swe Win’s case, the court is crowded with monks and nationalists, along with ordinary observers. Almost two years of hearings, verbal threats and financial hardship have taken a toll on Ko Swe Win’s family. His wife has even asked him to consider a career change. In December, The Irrawaddy attended Mahar Aung Myay Court and witnessed police officer Naing Moe Aye’s testimony and cross-examination by defense lawyer Daw Ywet Nu Aung at Ko Swe Win’s 48th hearing. Daw Ywet Nu Aung asked the investigating officer whether he was aware that monk U Wirathu had praised the murderers of U Ko Ni, and that this praise was the basis for Myanmar Now’s article, which its editor shared on his Facebook account. The police officer simply answered that he “did not know that.” The Irrawaddy has learned from the Mandalay court’s records that the plaintiff left out of the complaint the fact that Ko Swe Win shared the article. Ko Swe Win said he had in fact discovered numerous legal irregularities in the prosecution of his case. “For instance, my lawyer asked a very important question of the police witness during the hearing: Why did police accept the case in Mandalay instead of where [the alleged defamation] took place—in Yangon? Would a court summon an accused who lives in Tanintharyi Division’s Dawei to appear in Kachin State’s Putao? If the accused failed to attend the court hearing, would he be jailed?” asked Ko Swe Win. If a plaintiff fails to appear in court, the defendant’s lawyer can request to appear on behalf of his client in a default hearing. Ko Swe Win’s lawyer made such a request, but the court rejected it on Wednesday. Ko Swe Win also claims police failed to follow proper procedure in his case. According to procedure, police from the jurisdiction in which the alleged offense took place are authorized to arrest the suspect. But, in his case, police from Mandalay came down to Yangon and arrested him at the airport. “These points contradict police procedure as well,” Ko Swe Win said. She said the hearings could drag on for two years if the plaintiff’s witnesses continue to intentionally fail to show up in court. Out of 13 witnesses, three are due to testify in court in the coming weeks. Even monk U Wirathu asked the judge to hold the hearings at the Sangha authority building, instead of in a courtroom. The court rejected the request on Wednesday. Ko Swe Win’s case is not unique. In 2018 alone, 12 journalists were sued under the Telecommunications Law for defaming the state, or prosecuted under the Official Secrets Act. In the highest-profile case, two Reuters journalists, Wa Lone and Kyaw Soe Oo, were imprisoned for seven years after a one-year trial. A judge rejected their first appeal to the Yangon Divisional Court last Friday. Despite the fact that his lawyer has poked significant holes in the case brought by the plaintiff, as well as the legal procedures and investigative officers’ report, Ko Swe Win does not have high hopes of success, as his case has implications both politically and for police independence. He said police should strictly follow established procedures and work with the court. To improve the judicial system, he urged that independent police investigations be introduced under the supervision of the judiciary. The adoption of such a mechanism appears unlikely, however, as long as the Ministry of Home Affairs remains under the control of the Army. He also questioned the reliability of evidence submitted by police and the plaintiff. The police’s lack of impartiality, he said, could sway the final outcome, as the judge takes into consideration the evidence and testimony of the police officer.